"After nearly 10 years out of production, Banned in DC is finally back in print. It was thought that the sixth edition -- which was released in 2005 -- would be the final version of the book, as the many of the negatives used to make the printing plates had deteriorated beyond use. However, due to consistent demand, Connolly decided to undertake the laborious task of recreating the book, hewing as closely as possible to the original design only this time as a permanent digital negative. 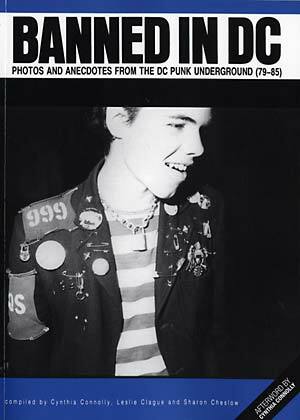 Assembled by Cynthia Connolly, Lelsie Clague, and Sharon Cheslow and originally released in December of 1988, Banned in DC collects hundreds of photos, flyers, and stories documenting the DC punk scene of the mid-'80s. The intention of the book -- one of the first to be published on punk in the US -- was to capture the feeling and energy of the movement, using stories from the many people who were involved. Images of many of the bands of that time can be found in this book: Minor Threat, Faith, Marginal Man, Scream, Red C, Bad Brains, Nuclear Crayons, Insurrection, Hate from Ignorance, G. I., Bloody Mannequin Orchestra, Void, Second Wind, and many more. With the seventh edition of Banned in DC, publisher and founding author Cynthia Connolly has added an eight-page afterword explaining how and why the book came together. The story highlights years growing up in Los Angeles in the late '70s and early '80s -- going to shows and discovering and documenting the punk scene in DC after her family relocated to the area in 1981." Softbound, 185 pages; black & white.